The 2-Way splitter is designed to “split” the mobile signal from the output of your repeater to up to three indoor coverage antennas. The splitter is perfect for applications that require coverage of up to three different areas from a single repeater base unit. The 2-way splitter will divide the signal strength from the repeater output into thirds and feed three indoor coverage antennas which you can locate in different areas. You can use the 2-way splitter to divide the signal output from your repeater and feed up to three indoor coverage antennas. You can purchase additional cables to connect your indoor antennas. 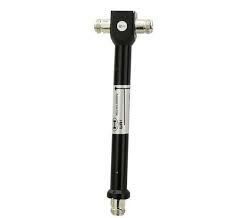 The most popular style of indoor coverage antennas for applications with splitters are the MR omni-directional ceiling mount antennas, which can be found here. Installation involves connecting the splitter with a short cable lead to the input of the splitter. The three signal outputs connect with cable to the indoor coverage antennas.